This is a new product. It comes in the same great 8 oz. 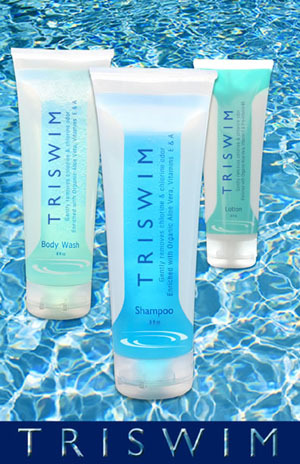 tube that all the other TRISWIM products come in (it stands on the cap for convenience in the shower and to and from the pool). This product keeps your hair shining and supple and keeps hair from turning GREEN. It also prevents the fly-away and "split-ends" look of the every day swimmer. TRY THIS PRODUCT..YOU'LL LOVE IT! This 64 oz jug comes with a pump for easy use and is equivalent to 8 tubes of the Triswim Conditioner. This is a great economical way to have the best conditioner on the market at a much lower price. The pump will prevent wasting conditioner by squeezing the tube too hard and getting more than is needed. One pump is just right with no waste.